For most people the thought of learning to fly has been a childhood dream that has never been fulfilled. What might surprise you is that learning to fly is not as difficult or as expensive as you may think. 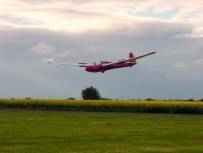 At Cotswold Gliding Club we can offer you this opportunity to take to the skies and learn a skill that you will never forget. If you have never experienced gliding before it is an adventure like no other. Once airborne you can savour the unique perspective on the landscape whilst experiencing the thrill and excitement of soaring through the air. One Day Course – What’s the benefit? 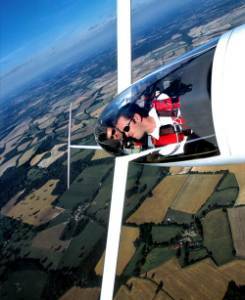 A one day course provides no more than two students with a training glider and instructor for a day. This allows for some personal tuition that can reflect the abilities of the student. It also provides the opportunity for the student to immerse themselves into the club operations and get a feel of what it’s like to be a member. We find that by having intensive training sessions, students will learn much more from the instructor than would be possible through normal club attendance. For a beginner in gliding the Introduction to Gliding Course submerges you into the gliding world. The day consists of briefings and flying instruction covering areas such as airfield safety, effects of controls and primary gliding exercises. The Introduction to Gliding course provides the student with the opportunity to get to grips with gliding as the instructor is available to brief on any desired areas and answer the student’s questions. Due to aircraft restrictions we cannot fly anyone who is over 110kg (242lbs) in weight. People over 1.9m (6’-3”) may not fit in the glider. See our FAQ for more detail. Alcohol – For legal and safety reasons you must not fly if you have more than 20 milligrams of alcohol per 100 millilitres of blood (a quarter of the amount for the UK drink drive laws). This is effectively a zero limit. Health - You must declare before your flight any health condition that may potentially affect your safety whilst in the air - e.g. motion sickness or epilepsy. Loose Articles – No item must be taken into any glider cockpit that is not secured to the person e.g. mobile phone, pens, camera without strap or any items loose in non zipped pockets. Items with straps must be secured well away from any aircraft controls or instrumentation. Any items that cannot be secured must be left on the ground. Children are welcome but must weigh at least 45kg (99lbs) and be be accompanied by a parent.